Our last day of vacation dawned somewhat drizzly—but this sort of weather is common in Vancouver. Wait ten minutes and the sun pops out—which it did. We had to check out of our room at 9. 30 am and so we hurried with our showers and finished our packing with the idea of stashing our bags back at Margaret’s to which we adjourned for another grand breakfast. I had a couple of errands to run right after breakfast and Margaret was obliging enough to take us around to the shops to get them done. Before we knew it, it was time for lunch and we were quite delighted to feast on the marvelous leftovers from last night’s bistro dinner which we had carried home in doggie bags. As might be expected, they tasted even better the next day. Lunch done, Margaret suggested we watch Amal, a very interesting off-beat film made with Canadian-Indian collaboration starring Naseeruddin Shah and Seema Biswas as well as a new British actor of whom I have not heard, Rupinder Singh. The film was heartwarming and thought-provoking and led to a nice post-viewing discussion. It was also a very relaxed way to finish up our hectic vacation, so we were grateful for the quiet time. It was time then for us to get to the airport for our red eye flight back home. Margaret once again stepped in to offer us a ride and an hour later, we were checking in for the first leg of our Alaskan Airlines flight to Seattle. There we raced off to Wolfgang Puck Express for another Pizza (the Mushroom Special—just as delicious as the meat-laden one with which I had started my vacation) and then we made our connecting flight from Seattle to New York. We traveled first class but despite the extra leg room, we were unable to sleep for more than a couple of hours. We arrived in New York’s Kennedy airport at 7.00 am from where we quite easily used the Airtrain to get to Budget from where we picked up the rented car that got us home to Connecticut. It was annoyingly long as we fought traffic all the way home and took more than two hours for what is usually a one hour journey. Still, we had a great homecoming and a lovely reunion with my brother and his family who had a Welcome Home poster on the door waiting for us. Although we’d had another one of our top vacations, it was great to be back home in our own bed and baths again and to savor the joy of a home that we truly love. Thanks for following me on this stretch of my travels. It is always a pleasure to have you by my side as I explore the world and see it through eager eyes. Until I gallivant away again, I wish you happy journeying. May the road rise up to meet you! This entry was posted on July 11, 2016, in Bon Voyage!, Canada, North America and tagged British Columbia, Surrey, Vancouver. We awoke and breakfasted at Margaret’s. Her unit was just a three minute walk away and it was a sheer pleasure to pass by the homes of the folks in Chelsea Gardens which is superbly landscaped and truly a dream environment for the retired. Llew and I kept thinking that we would not mind buying a place there ourselves! Margaret had a fabulous Continental brekkie ready for us: cereal with milk, English muffins and French croissants with butter, jam, mango juice and coffee. It was fit for a prince and we ate well. We then bid her goodbye and called a cab to take us to the home of our friends Louella and Kevin (parents of the bridegroom) so that we could have some private time with them—because apart from wishing them briefly at the wedding, we had really not interacted with them at all. They were very obliging indeed in having us over and we really did spend a delightful morning in their beautiful home and garden which we were visiting for the first time. The Euro UEFA16 finals match was on between France and Portugal and most folks had congregated in the family room to watch it. Llew spent a while taking in the excitement in front of the telly while Louella gave me a tour of the gardens pointing out beautifully established trees and newly planted ones The garden was a riot of lovely color and with perfect temperatures outside, it was truly a pleasure to sit there and enjoy the ambience of it all. About two hours later, we called another cab to take us back to Margaret’s at Chelsea Gardens and it was not long before she drove us to Apna Chaat House for a really unique lunch: Indian chaat which is basically street food served all over the country. We ordered an enormous portion of bhel puri and Punjabi Mix which was dahi, sev, batata and bhel puti all mixed together. The portions were huge so that with kulfi falooda that finished our meal, we had ourselves a royal repast—and a most unusual one for Llew and me who do not have many Indian eateries where we live to indulge our nostalgic teeth! Back home with Margaret, we adjourned to our room for another shut eye—we realize that we have lost out on a great deal of sleep, thanks to early morning risings to whale watch and late evenings out at the Piano Bar. Still, we are not complaining. There will be time enough for rent when we get home. Margaret called us back to her place for a drink before dinner to which she was treating us—at Tasty Bistro in Surrey. I had a beer, Llew had red wine, Margaret had a rum and coke and then it was time to drive off to one of the best Indian meals I have ever eaten. We ordered Chilli Paneer, Kadai Chicken and Fish Curry over rice with garlic naans and we had a Kulfi for dessert. This meal was truly different from anything we had ever eaten plus we had the pleasure of seeing Margaret’s son Glen and his girlfriend Ann who made super company. Overall, it was truly a good evening and a really fun time for us. It was about 10. 30 pm when we got to bed after yet another lovely day in the company of friends of whom we are very fond. This entry was posted on July 10, 2016, in Bon Voyage!, Canada, North America and tagged British Columbia, Surrey. Today was all about the wedding we had come to the West Coast of Canada to attend: that of Andrew Matthias (son of our close friends Kevin and Louella Matthias) with Laura Martin. Nuptials were at 11. 30 am at the Church of Corpus Christi on Nanaimo Road in Vancouver and the reception was at the Riverside Banquet Hall in Surrey, a suburb of Vancouver. We had accommodation arrangements made for us by our friend Margaret Deefholts who lives in a gated complex called Chelsea Gardens in Surrey; but we realized soon enough that we’d have no time to get to Chelsea Gardens from Canada Place in downtown Vancouver where we docked, dress and then race off to the nuptials. The plan then was to get to the Holiday Inn in Surrey where our friend Susan had a room. We’d get off the boat (hopefully really early) and cab it to the Holiday Inn, dress for the nuptials there and then catch a ride from Susan to the church. By requesting every HAL personnel to “get us to the church on time”, we actually managed to get our bags out and into a cab and although we docked at 7.00 am, but 9.00 am, we were in the lobby of the Holiday Inn at Surrey—record time all around and thank you HAL! Fifteen minutes later, having changed into formal wedding togs, we were in Susan’s rented car and off to the church. The entire ceremony was lovely, the bride was beautiful and radiant, the groom looked handsome and happy, both sets of parents looked very proud and the congregation was truly thrilled to be there to witness their vows. Llew and I were really happy to have made it on time. After the service, we piled back into Susan’s car, stopped off at a mall to pick up lunch from a food court (Pad Thai for me, chicken curry for Llew) and were back at Susan’s hotel joining a few of our other friends to eat a delicious meal. An hour later, our friend Margaret arrived to pick us up and take us to Chelsea Gardens and settle us into our lovely quarters—a large en suite room that was bright, airy and spacious. It was all I could do to stop myself from taking a lightning power nap—for exactly 20 minutes, before it was time for us to shower and change for the reception to which Margaret volunteered to drop us off. The Reception was a hoot—we had a swell time over a lovely reunion with many of our New York Tristate area friends who had trooped in from New York, New Jersey and Connecticut. Over cocktail hour, we renewed acquaintance with many friends, enjoyed the speeches and the food and drink and danced the night away. It was a lovely evening indeed but by 12 midnight, we were fading and decided to call it a night. Our friends Ian and Jenny who had a rented car, volunteered to drop us back to Chelsea Gardens where we spent a very restful night. This entry was posted on July 9, 2016, in Bon Voyage!, Canada, North America and tagged Vancouver. I awoke on my birthday with a jolt to realize that we needed to race down for 8.00 am Mass. Since I wanted to serve as Lector, it was important to get there early. By 7. 50, I was in the Hudson Room and Fr, Tim was presenting me with the reading for the day. I went through it rapidly, quite thrilled indeed to be able to hear Mass on board on my birthday. It was our last Mass of the cruise and Fr. Tim said a special blessing for us. As usual, the Lido was mobbed by people who wanted a long and leisurely brekkie on their last day on board. I got the Swiss Muesli for a starter followed by waffles with strawberries and cream and OJ. Llew and I found a really nice spot to watch the many islands of the Vancouver Archipelago slide by us—some large, some small, some far away and misty, others really close at hand. When we felt quite sated, I decided to go for a presentation to the Queens Lounge on ‘Alaskan Explorers’ given by naturalist Humberto—and it was very informative indeed. He spoke to us about Vitus Bering, about Dahl (after whom the porpoises are named), about Seward (after whom an Alaskan city is named), about George Vancouver’s role in mapping out the region and finally about the Alaskan Purchase (from Russia). After an hour, we decided it was time to return to our stateroom to begin our packing as tomorrow by this time, we will have docked at Vancouver. Determined to enjoy every last minute on board, we also wanted to make sure we stayed on track. For the next hour or so, Llew and I focused on getting all our stuff into our suitcases (concealed under our bed) while also keeping aside the things we would need for the rest of the day (including semi-formal dinner wear) and clothes for the next morning’s departure. We are quite amazed by how much we have accumulated even though we kept our buys to the minimum. Packing done, Llew and I decided to go for the Mariner’s Lunch at the Manhattan for which we were especially invited. We were ten minutes late but we need not have worried. Sit -down service for a three-course lunch was offered. We both opted for the Crab and Shrimp Cocktail served already dressed in a light mayonnaise with shredded lettuce. For a main course, I chose the halibut with grilled shrimp served with a lime-cilantro sauce and grilled asparagus, while Llew got the beef brisket with mashed potatoes. And for dessert, both of us chose the Mixed Berry Cobbler which was absolutely delicious. Coffee and petits fours were part of the meal and we enjoyed them both before we got back to our staterooms. I was keen not to leave the boat without putting in at least one session at the gym. Having walked around the deck several times for exercise, I decided I ought to go and check out the gym and take in the views of the passing islands which were just a visual treat at every juncture. And indeed, that was where I went after I climbed into a T-shirt, shorts and my sneakers. For the next half hour, both Llew and I were at the elliptical machine gazing at the prow of the ship and the route that lay ahead of us. It was absolutely delightful and I was sorry I had not found the time to get to the gym every single day. But then, that’s the problem with being on a cruise that offers so much. It was essential to me to have tried varied experiences each day and to have immersed myself in the true spirit of cruising which does involve dashing from one end of the ship to the other and from the lowest floors to the topmost. By this time, we discovered that a single game of Bingo was being offered in one of the lounges and that the prize was a 7-day cruise for two to the Caribbean or Mexico. Well, you have to be in it, to win it, right? What a great Birthday Present it would make! So off we raced to the Queen’s Lounge to buy our tickets—a card of six for $35 and to play a form of Bingo which was slightly different from the “Housie” with which we are more familiar. I have to say that it was fun and when we started sweating for just 2 more numbers on one of our cards, we were sorry that someone else won the house, but not so sorry when we discovered that the guy who won the prize was also celebrating his birthday! Oh well, at least one Birthday Person got a really unforgettable present that day! We did actually find time for a nap—a short one for me, my usual 20 minute shut eye– before I darted off to the Explorer’s Lounge to pick up all the recipe cards that pertained to the many cookery demonstrations that had been carried out on the liner. Several of these demos had been presented when we were sightseeing in the various ports—and so we had missed them. It was good to collect about thirty recipe cards for some of the delicious concoctions we had enjoyed during the cruise. That task accomplished, it was time for us to get back to our staterooms to shower and dress for dinner as we had reservations at the Pinnacle Grill which is one of the specialty restaurants on the ship. We would be wearing our glad rags for the last time on the cruise and we were glad that it would be on my birthday. Our 8. 30 pm reservations at the Pinnacle Grill saw us seated at a lovely sea-facing table with an amuse-bouche of stewed mushrooms placed before us in tiny demi-tasse cups. We were sorely disappointed that the Alaskan King Crab Legs were all gone—but in all fairness, it was the last day of the cruise and we had a very late reservation. After we ordered drinks (a Cabernet for Llew, a vodka cocktail for me) we got down to ordering our three-course meal: it was going to be special, we hoped, for it would be nice to save the best for last. Since our friend Tony who had tasted the Lobster Bisque at the Pinnacle Grill on our last cruise had pronounced it the best he had ever had, both Llew and I decided to have that. And it was amazing–just filled with lobster bits and very flavorful indeed. For a main course, I chose fish again with shrimp scampi while Llew had steak and for dessert, the two of us chose the Not—So Classic Baked Alaska with Cherry Garcia Ice-Cream and Bing Cherries Jubilee which is a HAL specialty, a demo item by Chef Suraj, a few days ago. And just when we thought the meal was done, along came a waiter with a massive slab of Chocolate Mousse Cake to celebrate my birthday. Sadly, he did not sing Sarta Murliya—which is the traditional Indonesian song that is sung almost every night at the Manhattan. He merely sang a quiet Happy Birthday, but there was a candle and he did procure a knife and I did cut the cake—which Llew and I only proceeded to taste (it was awesome) as we were filled to bursting with our celebration meal. I can only say how blessed I feel that for several years in a row, I have celebrated my birthday in different parts of the world—in the past few years, it has been in Berlin, Kyoto, South Africa and now in Alaska. Outside, our ship was worming its way through what is known as the Seymour Narrows—as the name says, it is a very narrow inlet through which the captain maneuvers the craft. Islands passed us by in the soft shades of a North American dusk as we inched closer home with every nautical mile we covered. It was a lovely birthday and one that was made special by the many email and Twitter messages I received from family members and friends around the world. We ended a really terrific day at the Piano Bar in the company of the one and only Jimmy Maddox who, on having been told at the gym, where we had met him earlier this morning, that it was my birthday, decided that he would sing and play for us his funny Birthday Song. Well, it was a funny song indeed and it was great fun to have the entire crowd at the bar (and there were hordes as it was the last night and Jimmy had accumulated a faithful band of fan followers) as we ushered the almost-end of my birthday. It had been a night to remember and I was so thrilled by the way things had turned out. Llew, who was feeling a trifle unwell, had left earlier, but I stayed until midnight, when the bar closed, to see my birthday out in it’s entirely. Since we had put our clocks one hour forward at midnight, my birthday came to a sudden and abrupt end—but it was true fun while it lasted and I had a ball! Back in my stateroom, I found I had about ten minutes to zip up my case and place it outside our door for removal by the porters. I met the deadline and before long, Llew and I were fast asleep. Our last day on board had been packed to the gills but it had been a fabulous day and an amazing cruise and I have to say I was sorry it ended. This entry was posted on July 8, 2016, in Bon Voyage!, Canada, North America, USA and tagged Alaska, Cruise to Alaska, Inside Passage, Vancouver. As usual I awoke at 6.00 am and while Llew had a lie-in, I managed to get some blogging done. I was also excited to discover that my internet connection on my laptop actually worked and I managed to get and send email (unlike the last time I had traveled to Canada when I could not even find any internet connections). However, it was a good job I did everything I wanted for my joy was short lived. Within 20 minutes, it was gone. A little while later, after I had done some blogging, Llew awoke, showered, shaved, dressed and got ready. I followed swiftly, then went down to get us coffee and Nutella croissants from the local Tim Hortons downstairs and, not too long after, we were on the airport shuttle to get to the Skytrain that took us back to the Waterfront. The fact that it was a holiday weekend in Canada and a Saturday meant that trains were empty—this made it really easy for us to load and remove our baggage from the train. From there, we easily found our way to the cruise piers in the basement of the Convention Center. We thought we’d be one of the first to embark as 2.00 pm is given as Embarkation Time; but by 11.30 am, the place was already crawling with people and the Hall was filled. Everything was super organized with European precision and we were soon finding our way to the check-in counter where we were given our boarding cards by Holland-America Lines—HAL–(our baggage had been taken earlier) and then we were off and away. I was quite excited by this point especially at the thought of having a few hours to explore the ship and find our way around it. We had an ocean view room on the 4th floor which was very well located for the Reception Counter, main shops, etc. were just a floor below. In no time, we were aboard but went directly to Reception to try to make a lunch reservation on one of the two days it is usually offered in the pan-Asian restaurant called Tamarind—about which I had read on the internet—but was disappointed to find that it has been discontinued. So off to our stateroom we went and found that it (and the rest of the ship) is an exact replica of the Eurodam on which we had sailed through the Baltic Sea in 2013. There was a sense of comfort in the familiarity of it all but it was also a trifle predictable. Perhaps it would have been more fun to discover new horizons! We did not lose much time in our rooms, however, as our bags had not yet arrived. Instead, as it was almost 1.00 pm and as we only had a croissant and coffee for brekkie, we went off to the Manhattan, the Main Dining Room—for lunch. It was our first meal on board and I looked forward to something really special. Only a few people were in the restaurant—most were still embarking. Both Llew and I chose the Cream of Broccoli Soup for starters—it was thick and very delicious. I avoided the bread as I am still trying to limit carbs. For our main, I had the Apricot-Glazed Salmon served with zucchini and carrots and steamed potatoes (which I avoided). Once I got over the sweetness of the apricot sauce that was poured over the salmon, it actually turned out to be quite good. Llew had the Pulled Pork Sandwich served with Red Cabbage Slaw which was really good. For dessert, the two of us had the Biscotti Ice-Cream—I ordered mine with a few strawberries. So that was it. It was a good meal, but not outstanding, but the cruise had not even begun yet. It was time to get to our stateroom where we found that our baggage had been delivered together with a whole lot of delicious goodies—a tray of tea-time sandwiches (smoked salmon, brie, ham and cheese, prosciutto—all fab), a tray of sweets (truffles, cake, a chocolate tower), a tray of cut up fresh fruit—together with a basket of fruit and a lovely flower arrangement. We felt very special indeed! It was time to unpack and we found spacious closets with room enough for all our needs (I certainly travel very light and had no difficulty accommodating all my things). Unpacking done, we stashed our bags under our bed and went off to Reception again to made reservations for 8.00 pm dinners at some of the specialty restaurants on board at a time that would also allow us to attend the shows in the theater each night. All that done, we made our way to the theater for an introduction to the facilities and amenities available on board as well as to take a walking tour of the main areas of the ship and the areas we intended to use—such as the gym, the pools (indoor and outdoor), the hot tub, the Crow’s Nest which is the enclosed 11th floor Observation Deck, etc. By this time, it was close to Embarkation Time and we had the mandatory Emergency Drill procedure to attend on deck. Having gone through this before, we knew exactly what to do and in no time, we were on the deck, participating in Roll Call, listening to evacuation and other instructions and chatting with a few other passengers. When it was over, it was time for departure so we made our way to the Lido Deck on the 9th floor at exactly 4.45pm to attend the Sail Away. This included drinks on the deck, the opportunity to grab one of the deck chairs that we positioned at the very front of the ship (it helped to get there early–but this turned out to be the aft or back) and to enjoy views of Vancouver as we departed. Going under a great big bridge was an additional treat as we listened to music, chatted with a few of our companions, enjoyed the complimentary nibbles—salmon, beef steak in horseradish sauce and spoons of baked brie with cranberry sauce and nuts–as we saw Vancouver recede in the background and the islands of the Archipelago that we had seen en route to Whistler by road come into view. Llew enjoyed lying on the deck chair while I left at 5.30 to pick up the complimentary ship’s charm that was offered to anyone who arrived at the Main Shopping Desk. I then reconnected with Llew as we returned to our stateroom. I ordered a cup of tea from Room Service and we began nibbling on our savory goodies in our room as Llew sipped some wine. It wasn’t long before we dressed for dinner and went in search of the complimentary glasses of champagne offered by the jewelry showroom and art gallery on board and with that in hand, we made our way back to the Manhattan to have dinner before we could attend the live show in the theater. Only we discovered that our wait for dinner would be 20-25 minutes and, rather handily, since the Explorer’s Bar was just next-door, we sat down to enjoy a violinist and a pianist do wonderful soft classical chamber music. We were hugging the coast of Canada throughout our sail and the movement of the sea could barely be felt at all. Very shortly, we were seated for our first dinner at sea in the Manhattan, a massive dining hall, where we found the menu for the evening was devised by chef Elizabeth Faulkner of whom I have never heard. I started with the Broiled Scallops with Bacon, Avocado Mash and a vinaigrette—but my scallops were tiny, the mash was bland and I found no interest whatsoever in the dish. Llew had the salad of mixed greens with caramelized apple which was far better. Since I was dying to also try it, I asked for a tiny portion of the Ketchikan Fisherman’s Chowder in a sample serving (it was served in a bread bowl as a regular portioned starter) and found it to be simply delicious and filled with tiny scallops. For a main, Llew had the Shrimp and Chorizo with Grits which was served with okra—a typical New Orleans dish—while I chose the New York Strip Loin done medium rare. Llew got three very large shrimp and I got an outsized piece of steak. We split our entrees and while they were both good, there was nothing to shout about either one of them. For dessert, Llew got the Mango Mousse while I got the Klondike Gold Rush Baked Alaska which was a brownie, topped with Vanilla Ice-cream and Meringue with a chocolate sauce poured over. Again, it was good but not outstanding. Since we needed to rush off for the show, we grabbed our things and left right after dessert. In the theater, we found ample room. Nick, our Cruise Director, was holding forth, calling out a few raffle numbers and giving out prizes before the main act of the evening arrived—a stand up comedian called Chad—who entertained up for about 15 minutes. His jokes and his acting were pretty lame and by that point in time, my eyes were closing. It was 10.00 pm and any hopes I had of sitting in a Piano Bar and singing along were wiped off as we decided instead to get back to our stateroom and call it a night. But after changing and getting into more comfortable wear, we headed to the Crow’s Nest to see what it felt like to enter the Seymounr Narrows, a tiny inlet just past Vancouver Island. However, it was very dark and while we could see land on one side close to us, we saw nothing on the other side. We did see—literally—a ship pass us by night. It was a Holland America ship returning to Vancouver—which is where we will be a week from now. It was time to well and truly get back to our staterooms to sleep. It had been a packed first day and we did not have a dull moment. This entry was posted on July 2, 2016, in Bon Voyage!, Canada, North America, USA and tagged Alaska Cruise, Vancouver. Awaking in our hotel in Pemberton, we showered and got ready quickly as we were supposed to return our car to Budget by 10.00 am. Bluebird Bakery was just opposite our hotel and there we picked up coffee with almond croissants and pain au chocolat and were off. The day was cool and drizzly and the mountains were shrouded with rain clouds that hung low upon them. As we zipped back down the mountains, we enjoyed the repeat journey that seemed much different as it turned out that we were in Canada on their national holiday—Canada Day—when the locals were enjoying a lie-in. This made it super easy for us to drive through the two downtown areas that had been chocobloc the previous day. We returned our car to Budget, took the shuttle bus to the Travelodge where we had another night’s booking and once we stashed our baggage safely in their store room, took the shuttle to the Skytrain station to begin our day long exploration of Vancouver. The Skytrain is one of the most convenient ways by which to get around Vancouver. It is new, clean, speedy and cheap. We took the Canada Line intending to get off at the Waterfront stop—which is Canada Place, a huge convention center–and the spot from where cruise ships take off. Well, on the train itself we got an idea of the patriotic spirit of the Canadians. We have never seen more red and white in our lives. Seas of people made their way to the spot and once we got there, we realized why. There was a stage set and live music was being offered. The Convention Center is the setting for the Citizenship Swearing Ceremony and loads of people who had taken the oath earlier that morning were on the pier taking pictures, their garb sporting their patriotic enthusiasm and their faces painted with Canadian flags! It was amazing. Absorbing all the energy around us, to see the rainbow hues that comprise the Canadian populace today, to imbibe their spirit—made it simply infectious. We walked to the north end of the pier intending to look at the possibility of taking in Vancouver’s newest attraction, Fly Over Canada—a virtual show that is 4-D (it offers movement, sights, sounds, smells) as you fly across the country from the West coast to the east for approximately 25 minutes and $25. However, since the wait for the next show was about an hour, we decided to pass on it and move on. Instead, we feasted our eyes on a unique exhibition of Canadian war vehicles that were assembled in the main hall of the Convention Center for children to pose on. It was poignant as today is the 100th the anniversary of the Battle of Beaumont-Hamel, one of the battles of the Somme, at which about 700 ‘Newfies’ (Newfoundlanders) lost their lives. It is a Memorial Day of mourning in the province. Walking, through the use of a map that we found at the Visitors’ Center, we made our way to Chinatown to get away from the chaos of downtown Vancouver on their holiday. As expected Chinatown was tranquil and offered some relief. Since it was lunch time, we asked a local for a recommendation and they directed us to Our Town which CNN’s Food Critic says is a “Must-Visit”. The place was full of locals which is a safe bet that the food would be good. As most of these places are, it was a little hole in the wall but packed to the gills. As recommended by Lonely Planet, we ordered the spicy pork steamed bun which we split—very delicious—followed by the Shrimp Dumplings—served dim sum style, four in a little steamer basket. They too were very good. Our main was a Shrimp Mongolian Hot Pot which had the most shrimp we have ever seen in a lunch order—good job we shared it as we had at least a dozen large shrimp each. And because I actually found it on the menu, loved it when I had last had it in Manilla in the Philippines in January and had adored it then, I ordered a Halo-Halo that we also split. You will remember that this is a very filling dessert served in a glass. It is layers of sweet red azuki beans, preserved fruit such as jackfruit (in this case), preserved coconut, a variety of noodles, loads of ice-cold milk and a big dollop of vanilla ice-cream. Of course, Llew loved it too and we realized that we would be skipping dinner after what had been a really inexpensive and most scrumptious meal. We ended our visit to Chinatown by making a quick pop into Dr. Sun Yat Sen Gardens, one of the best classical Chinese gardens in North America. There usually is a steep entry fee that includes a guided tour, but since it was Canada Day, there was no fee and we had a lovely stroll around which brought us memories of the time we had visited this place on a previous trip to Vancouver. We were also able to see a really superb Chinese opera show in the adjoining Museum where the costumes and the makeup were simply spectacular and reminded us very much of our time studying about Noh Theater when we were in Kyoto, Japan, a few years ago. By this time, both Llew and I were showing the effects of jetlag and an overlarge lunch! It was time to find the Skytrain station to take us back to the Waterfront and from there on the Canada Line again to get to the Airport from where we caught the shuttle bus to get us to our hotel. We checked in, picked up our stored baggage and made our way up to our room. It was still only about 6 pm, so we spent the rest of the evening catching up with world news on TV and watching a couple of TV shows. It was a very relaxed evening to a rather full day. It was time to call it a night after checking email one last time through Wifi. And then it was time for bed. Tomorrow, we board our cruise ship to Alaska—we will make our way once more time to Canada Place. It has been a good start to our travels and we are very excited. This entry was posted on July 1, 2016, in Bon Voyage!, Canada, North America and tagged Canada Place, Pemberton, Vancouver, Whistler. We awoke well refreshed and ready to hit the road again on our little adventure in Canada’s beautiful British Columbia. We showered, packed, and made our way down to the lobby to pick up the free airport shuttle that got us to the airport so that we could pick up the Budget car that we had rented for the next 24 hours. It was a painless process to get there and get our car organized and within an hour, we were browsing around the Designer Outlets that were very handily located right at the airport so that Llew could pick up a few clothes for the day ahead as he was still in the ones in which he had traveled. Banana Republic made it really easy and since there were special Canada Day sales, he really did get some good stuff for very little money. Now, in the event (God Forbid) that his bag has not arrived by the end of today, he will have some clothes to wear—he will be reimbursed by American Airlines upon submission of receipts. We then hit the road from Vancouver to Whistler, the little ski resort in the north that catapulted to fame in 2010 when it was chosen as the site for the Winter Olympics. With Llew at the wheel of a Toyota Corolla and with me navigating (yes, using an old fashioned map as we did not have a GPS and did not wish to use pricey data roaming in Canada), we were off. We did not realize that we would have to go through two crowded, busy downtown areas (Vancouver Island and West Vancouver) before we hit the 99 North highway that took us directly to Whistler. Still, I was not complaining. We had no agenda, no deadlines, no urgency to get anywhere and, meanwhile, we had the leisurely chance to admire the beautiful city that is Vancouver with its many islands, bridges, quaint old neighborhoods and snazzy new skyscrapers. And once we did hit the highway, the Pacific Coast road was simply spectacular and reminded us a lot of the travels we had undertaken, a few years ago, in the Canadian Rockies. In fact, the Whistler mountain range is merely an extension of the Rockies—so the scenery was similar. Except that here instead of just mountains, you also have the splendor of the ocean which the road hugs all the way to the north. The sea is punctuated by glacial islands that broke off many millennia ago from the northern ice-caps that comprise Alaska so that fjords and islands dot the sea. We saw many sea craft in the water including a couple of small cruise ships—so we know what lies in store for us tomorrow as we pull out of Vancouver Island and make our way on the cruise liner to Alaska. It is little wonder that this drive is considered one of the most beautiful in the world and we savored every second of it. We stopped once for Brunch in a very exclusive community–that reminded us of Malibu in California–where we picked up lobster rolls and chicken salad in a local Safeway (supermarket) which we ate while on the road. I had not found the time to read up on Whistler before leaving home—so everything about the town was news to us. Apart from knowing that it is pretty and situated in the mountains, I knew little. What we found out is that it is essentially an Olympics Athletes Village that has been converted into a residential and touristic community. The Athletes Quarters are now private condos, the ground floors of which are bars, restaurants and souvenirs shops. We parked our car in one of the public parking lots and began our exploration of the two villages—there is an Upper Village and Whistler Village–on foot—which is the only way to go. We saw skiers making their way up the mountains but as there was no snow in sight, I have no idea where they were headed! A stop at the Visitors Center equipped us with a map and using it we negotiated our way around the little maze of cute streets—all of which look pretty much the same! There is a Sea to Sky Gondola that you could ride to be whisked up to the top of the mountain but having done this in Telluride, Colorado, only last year, we did not feel tempted to do it again. Instead we continued strolling about at random. The place was crowded, it was unusually hot and dry and, before long, we gravitated to an ice-cream parlor called Cows to get sundaes that we ate in the shade of a few trees. A bit more strolling took us to the landmark five Olympic Rings where we posed for the mandatory picture before we went in search of the Library—hoping to find an internet connection which did not work—and to the local Museum. There we watched a short film on Whistler’s development in only a century from a nondescript farming community to the pricey mountain resort it has become with million dollar housing. We stopped for a really reasonably priced lunch at a place called El Furniture Warehouse where we had burgers with salad and fries and then more ice-cream before we got into our car to drive further north to the little settlement of Pemberton where, away from the tourist rush, the snow-capped mountains of the West spoke directly to us. As soon as we entered the Pemberton Hotel, we found that Llew’s bag had arrived (much to our relief—well done, American Airlines)—but when we attempted to settle our bill, Llew discovered that he had left his credit card behind in the restaurant. Well, back into the car we piled to get to Whistler where his card was held safely for him and retrieved, with much relief, before we headed back to the Pemberton Hotel in what was once a tiny mining town. As both of us were jetlagged and sorely missing sleep, we had a very early night. We realized that Whistler is like all the other ski resorts we have visited—such as Telluride and Stowe, Vermont: busy in the winter, pretty in the summer, but really not distinctive in any way. This entry was posted on June 30, 2016, in Bon Voyage!, Canada, North America and tagged Whistler. This entry was posted on June 29, 2016, in Bon Voyage!, Canada, USA and tagged Vancouver. 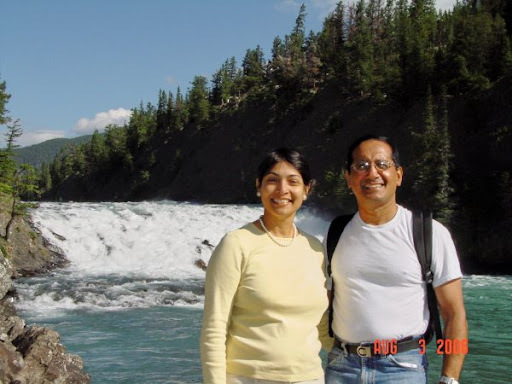 By the time we boarded the Greyhound bus that took us from Calgary to Vancouver, we were almost trembling with anticipation as we had heard so much about the scenic beauty of the area from friends who had visited the Parks earlier. And indeed, the drive did not disappoint. Both Llew and I were traveling by Greyhound after years. We had both forgotten how convenient, courteous and pleasant the service can be. The bus made frequent stops to allow us to use restrooms, stretch our legs, buy snacks (we ate loads of ice-cream on this journey) or eat picnic meals. As for the scenery, it was simply spectacular! 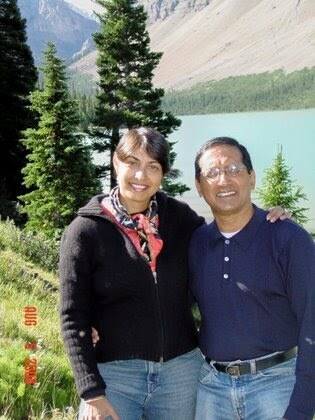 I was delighted that we passed through Yoho and Glacier National Parks, stopping at the towns of Golden and Revelstoke. As we went through Roger’s Pass, we saw the historic monument by the wayside. Needless to say, the mountains were our constant companions, following us in and out of the many tunnels, as we passed by bubbling rivers and playful cascades. We followed the tracks of the Canadian Pacific Railway throughout and once I even spied one of those elegant silver VIA trains snaking its way on the mountain in the distance. The air was so perfectly pure at those heights that we did not notice the hairpin bends that are sometimes prone to cause travel-sickness. It was a bit disturbing, at one point, to see a forest fire blazing on a mountain top far away sending thick whorls of black smoke spiraling into the air. A few minutes later, we saw the fire-fighting helicopters with the water bombs attached to them that open up just above the fire to douze it. We napped frequently on the bus and once we reached Kamloops, we were instructed to turn our wrist watches one hour behind for the change in time zone. When we entered the province of British Columbia, the landscape changed completely but remained extraordinarily beautiful as we passed by the lakeshore towns of Salmon Arm, Sorrento and Sicamous on huge Lake Sushwap. We enjoyed that drive tremendously and it will always remain in our memory as one of the most scenic we’ve ever taken. When we did arrive in Vancouver, after darkness had fallen over the city, we found our friend Margaret Deefholts waiting to receive us at the Greyhound Terminal. She drove us to her home in Surrey, about 45 minutes away, and had a hot Indian dinner waiting for us. After a whole week of enjoying varied ethnic meals, we were delighted to tuck into Fish Curry and Alu Mattar and Pea Pullao with Indian mithai for dessert! Margaret proved to be a most warm and generous hostess. Our bed was comfortable each night, she provided gargantuan breakfasts which included my favorite cereals (Kellog’s Mueslix and Jordan’s Muesli from England), chauffeured us to the railway station and back for our trips into the city, bought us take-out meals from local Chinese-Indian restaurants and provided valuable sight-seeing advice. We could not have asked for a better guide as Margaret is a well-published travel-writer and her tips were invaluable. It was at Margaret’s suggestion that we purchased tickets online for the Hop-On, Hop-Off Bus that took visitors through the heart of Central Vancouver allowing them to explore the major sights at their leisure. We had used such a service in Dublin, Ireland, a few years ago, and what with the humorous commentary given in a rich Irish brogue by the accompanying guide, we had thoroughly enjoyed that tour. We took the Sky Train from Scott Road Station in Surrey and enjoyed the experience of using local transportation the way most city dwellers did. Once we got off at Vancouver Central Station, we marveled at the architecture and the interior design of the building that housed local and long-distance trains as well as offered harbor ferry rides for those wishing to cross over into Northern Vancouver. As we made our way to Water Street to pick up our tickets, it started to drizzle slightly, a condition, we were told, that was quite common in Vancouver in the mornings. Fortunately, it did clear up and by the time we reached the famous Steam Clock to watch it toll the hour to the accompaniment of billing clouds of smoke, the sun had begun to peep out shyly. Then we were back at the main train station to board a ferry that took us to Lonsdale Quay on the opposite shore where a perfectly spruce and entirely enticing farmer’s market awaited us. We were amazed at the quality of the produce and the attractive manner in which fruits, vegetables, chocolates, baked items and other goodies were displayed. They were all quite irresistible but we had eaten an enormous breakfast and felt no hunger pangs at that point. Back in the main city again, we walked to the near-by Canada Place building to see the interesting sail-like architecture of the space that is used mainly as a launching pad for cruises to Alaska. Then hopping on to our bus one more, we rode it all the way to Granville Island which we reached across a very interesting bridge constructed in Art Deco Style. By this time, the sun was well and truly out and we had beautiful views of Vancouver Harbor as it lay in the midst of its scenic splendor. For the mountains in the distance, the sea views, the skyscrapers and the little yatchs in the marina on Granville combined to create picture post-card views of the city. Granville Island was once the center of Vancouver’s thriving industrial base. But when it fell to disuse and the warehouses rotted for years, it was truly an eyesore. Deciding to refurbish the area by converting the warehouses and factories into ample spaces for craft stores, public food markets, restaurants and boutiques, Granville Island today enjoys a second lease on life as the center of tourist activity in Vancouver and we saw hundreds of visitors enjoying the food courts and browsing through the one-of-a-kind stores. Llew and I chose to enjoy a tasty but very late and light Japanese sushi lunch in the food court in the public market before we hopped on to the bus again to take us past English Beach Bay and Stanley Park (both of which we would explore the next day) towards Chinatown, one of North America’s largest. Most of the Chinese who are settled in Vancouver today came to the country over a century ago as cheap labor to build the Trans-Canada railroad. While they are spread all over the more fashionable suburbs of the city today, their original settlement of Chinatown still retains a great deal of ethnic flavor. Arriving there about 5 pm, however, we found it surprisingly quiet and lacking the bustle that is traditionally associated with Chinatown in New York. However, we did follow the hints in our guide book and strolled along East Pender Street stopping only to see the Sun Yat-Sen Chinese Classical Garden, a wonderfully green cultural oasis in the midst of the busy city. We took many pictures around the pagodas, bridges, stepping stones, etc. that characterize such gardens before we decided to walk the short distance to trendy Gastown. We arrived at the famous bronze sculpture portraying “Gassy” Jack Deighton, a British sailor who boasted that he could set up a drinking saloon in the area. Before long, his boastfulness proved to be justified for the bar did sprout up. “Gas”town owes its name to the Braggart Deighton. A delightfully old-fashioned neighborhood of cobbled streets, quaint squares, an old inn, even a charming “Gaoler’s Mews”, we walked through it at leisure noting the history behind every unique building. Then we were back on the Sky Train again heading towards Margaret’s place where we regaled her with our varied adventures that day over take-out Indian-Chinese dinner from The Green Lettuce, an eatery that is run by Winston Wang, nephew of the famous Nelson Wang of Bombay’s China Garden Restaurant. Margaret is known by name in this place and we received VIP treatment though we had only stopped to pick up a take-out dinner! The next day, we continued our exploration of Vancouver heading on the Hop-On, Hop-Off bus (whose ticket is valid for two days) to Stanley Park, the vast green expanse at the east end of the city. The Totem Poles there are the biggest draw and we posed for pictures by these interesting native Indian art forms that signify one’s family ties in the same way that British crests, heralds and coats of arms do. Beautifully carved and painted by local native Canadian Indians, the poles are found all over British Columbia, a province that is extremely proud of its native Indian heritage. The free shuttle bus in Stanley Park took us through most of the sights in that sprawling space, but much as we wished to stay on to explore every nook and cranny, we had to hurry off to Granville Island once more to meet our Ontario-based friends, Valentine and Jacinta Gomes, who happened to be visiting family members in Vancouver at the same time that we were. While on Granville Island the previous day, we had spied the Pacific Institute of Culinary Arts and since we know from experience that such training schools offer meals that are incredible value for money, we had inquired about the possibility of a lunch reservation. As it turned out, we were able to reserve a table for noon the next day and our friends met us there for a long, leisurely and completely satisfying meal that was huge in both portion size and taste. Over Seafood Quiche, New York sirloin strip steak and Black Forest Gateau, we chattered incessantly. Then, full to bursting, we strolled around the island and returned to the city for more exploration. A few minutes after our friends bid us goodbye to keep another appointment, it began to rain again and the bus proved the perfect refuge for it allowed us to see the city while staying dry. Unique in every way, in its layout and its location, being surrounded as it is by inlets and creeks that are connected by imposing bridges, punctuated by lush gardens and boasting a large variety of interesting neighborhoods, Vancouver is indeed a very beautiful city and has much to offer both visitor and settler alike. It had met all our expectations fully and since we had two leisurely days in which to explore it, we felt as if we had seen it in its best attire. As I gaze with awe (undiminished by the fact that that they are mere celluloid reproductions on film-quality paper) at the many pictures we took on our trip to Canada, I relive the indescribable joys of having spent such a special time cosseted by the embracing arms of Nature. Having devoted a whole week to an exploration of the national parks in Alberta, Canada, and a second to a discovery of her Pacific coastal cities in British Columbia, Llew and I have returned home, renewed, refreshed and rejuvenated beyond belief. Our vacation began in the Canadian city of Calgary to which we flew from New York’s La Guardia airport. But setting aside the exploration of that city, famous for its August Stampede for a later date, we picked up our rental car from the airport and began the interesting drive towards the Rockies which, at that distance, were only faint outlines in the far background. Within a half hour, we were closer to those mountains that would keep us company for the next couple of weeks. Another hour later, we had reached the entrance to Banff National Park where we purchased annual passes into Canada’s park system and passing the “hoodoos” or rocky limestone formations along the highway on our right, found ourselves, just a few minutes later, cruising into the toy-like township of Banff. Without any further ado, we found and settled into our Bed and Breakfast accommodation, quite suitably named Squirrel’s Nest. A very modest homestead indeed, run by Calvin and Paul Shalotka and their four children (little Morgan was the friendliest), we were allotted the en suite bedroom that adjoined the dining room where all guests met in the mornings for breakfast. Our first stroll around Banff introduced us to a town that’s almost Disney-like in its story-book charm. The Alpine ambience of the entire township struck me immediately, as seen in the chalet-like houses and the masses of flowers that poured out of every available hanging basket and window-box. Banff sits silently in the verdant Bow Valley in the immediate shadow of two towering heights, Mount Rundle and Cascade Mountain. 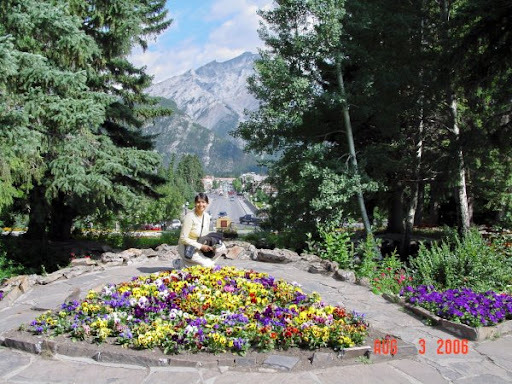 While these natural bastions quietly guard the town, it is on Banff Avenue or “Strip” that life becomes most vibrant. Lined by well-stocked souvenir shops and eateries, ice-cream parlors, old-fashioned “fudgeries” and bakeries, dalliances along the Strip are regular evening activity and by 6 pm., about the time we were checking out a possible place for dinner, most tourists, weary from having hiked and biked, fished and kayaked their way around the parks all day, were ready for some substantial sustenance. And the restaurants do not disappoint. From pricey gourmet eateries to more modest bistros and delis, you can find exactly what your taste buds desire in this eclectic place. There is every possible kind of ethnic cuisine available and for the next few days, we experimented widely. Though we settled for steaming plates of pasta at The Old Spaghetti Factory (the lasagna was fabulous, saucy, cheesy, gooey) that first evening to quell our own appetites, made gigantic by the bracing mountain air, we were equally pleased to spy the local Safeway from which we intended to purchase fresh ingredients each day for the picnic meals we wished to enjoy by lake side or gushing river beds. Morning breakfasts at Squirrel’s Nest were carb-heavy (think cereal, toast, bread and muffins, washed down by orange juice and coffee) but provided the requisite fuel for energetic holiday-makers, such as ourselves, who couldn’t wait to get out there and explore. Our guide book told us that if there was just one museum we would visit in the parks, we should make it the Whythe Museum of the Canadian Rockies—and that was where we headed first off. Based around the widely divergent but very fulfilling lives of Bostonian Catherine and Banffian Peter Whythe who adored the Rockies and spent a lifetime exploring and documenting them through their association with local Stoney Indians, the museum presented a lovely special exhibit on their own personal love story as well as their substantial collection of art work based mainly around the mountains. We learned a great deal about their lives and left with much admiration for this adventurous couple who braved harsh terrain and brutal winters so that they could live in the midst of so much unspoiled beauty. Though we did have a car at our disposal for the entire week, Llew and I did a great deal of walking and biking, having equipped ourselves with one of the trail guides that allow self-guided hikes. Each trail took us deep into the woods, far away from the seductions of the township and provided us with the possible opportunity for spying wildlife. Since we had both arrived in the mountains hoping to see animals and birds in their natural habitat, we kept our eyes peeled for any possible movement in the bushes and the trees overhead for our furred and feathered friends. That first morning, we enjoyed a trek along the Bow River banks towards the Fenland Trail where, deep in the heart of thick aspen forests, we felt completely isolated from the world, surrounded only by the murmuring of crickets and the occasional chirping of the birds. We saw large and beautiful magpies along the river banks and paused often to take their pictures just as we stopped on our woodland hikes to notice the numbers of evergreen trees that had fallen across the rivers—“deadfall” as rangers label them—several uprooted at the base. The Bow River, crystal-clear and reflecting the jagged ridges of the mountains, is present ubiquitously in this area all the way from Calgary up to Jasper, creating gentle waterfalls and deep canyons at frequent turns. It was on our way to Johnston Canyon by car along the gently meandering Bow Valley Parkway that we spied our first black bear, a cute cub with its forearms wrapped adorably around a tree. The bear attracted a great deal of attention and we learned, soon enough, that when a number of cars are parked on the motorway ahead, it is a sure indication that some interesting wildlife is lurking in the woods. And then imagine how overjoyed we were, when just a few yards ahead, we spotted a brown bear. Of course, on our first trek that morning, we had seen signs “warning” us that with the buffalo berries so ripe in the hedges, it was very likely that bears would be about as they love this treat and come down from the mountains into the valley to snack on them. But little did we realize that we would see them so early in our stay. Llew was not content with taking pictures of the brown bear from the car and, quite fearlessly and much to my anguish, he stepped out and headed towards the large and rotund animal, his camera poised high in the air, ready to click each time the beast raised its head and looked our way. We soon attracted a number of other drivers who also slowed their cars down, then got out of their vehicles for a closer look. The bear, quite nonchalant about all the attention, continued gobbling the berries and permitted us to take that occasional picture upon which Llew was so bent. A little later, its meal consumed, it ambled off rather peaceably into the woods, leaving us quite delighted at our sighting. 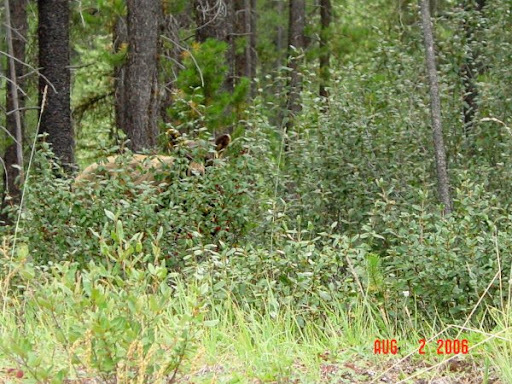 Imagine our thrill, a few days later, when on talking to Gord Antonius, a park warden, at whose lodging we stayed in Jasper, we discovered that the “brown bear” was, in fact, a grizzly, and that we had been privileged to receive one of the rarest sightings in the park! Oh, our trip was made, and we were left on such a high! We were still talking excited about it at dinner that night at A Taste of Sri Lanka in the Cascades Mall Food Court where we elected to find a curry meal after we had stopped to take pictures at the marvelous monolith of Castle Mountain, so-called because its ridges are reminiscent of the turrets of a fairy-tale castle. It was on this drive back home that we spied our first elk, a large buck with a magnificent set of antlers that bounded joyously into the undergrowth. Reaching the waterfalls at Johnston Canyon proved to be quite a challenge that day as one had to climb quite steadily up a narrow path all along the banks of the Bow River before one finally got to the cascades that thundered down into the canyon below. We were rewarded along the way with sightings of rather friendly golden-mantled squirrels who were tame enough to eat out of the hands of passers-by who insisted on feeding them though repeatedly instructed not to do so. Llew then decided to follow a bird-watcher into the woods at a clearing where I chose to take a bit of a rest and returned to me about fifteen minutes later with the greatest excitement. He had just spotted a pileated woodpecker, a large and very attractive bird with a deep scarlet crest that made it stand out magnificently against the green of the trees. Another birdwatcher had kindly passed his binoculars to Llew and together they shared the deep excitement of having spotted another rare species in the Canadian woodland. That evening, we drove as far as the village of Lake Louise, but we decided to save exploration of the lake for the following day. That was when we followed yet another trail along another bank of the Bow and arrived at the Bow Falls. Quite unimpressive really, the trek to these falls followed the serene banks of the turquoise river until we reached the rapids and we realized why they are called “white water” rapids. As the rivers churned ferociously over the little embankments on the bed, it created miniature falls that would be loads of fun if one were in a rubber dinghy. This trek also afforded us our first glimpse of the famous Banff Springs Hotel (left) at which we had a reservation for lunch later that afternoon. That morning, we also visited Canada Place, a rather nice stone building at the end of Banff Avenue. Though we only visited the interior briefly, we spent a great deal of time in the lovely Cascade Gardens (left) outside that we were privileged to see in their full summer glory. Indeed August is the best time to visit gardens in Western Canada and since both of us are such lovers of gardening, we had a marvelous time strolling among the raised beds that were planted thickly (50,000 plants each year!) with an abundance of annuals—petunias, impatiens, snapdragons, dahlias, geraniums, begonias and poppies in the most amazing shapes and colors, even early asters, created a riot of color in that lovely space. Woven between a rippling brook and lilting fountains, these beds made of natural stone from the neighboring mountains, were punctuated by arches, bridges and curving walkways. Overall, discovering the Cascade Gardens was an unexpected treat and one we enjoyed immensely. But soon it was time to return to our lodging to change into more formal clothes. 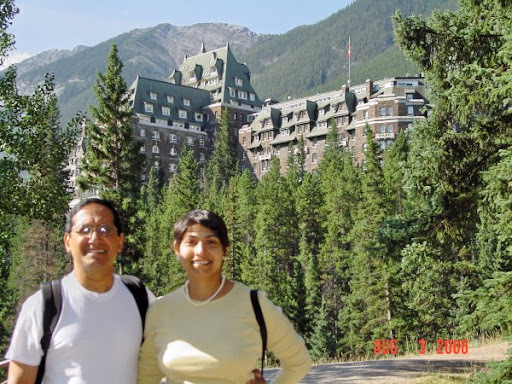 Our treks had worked up quite an appetite for our lunch appointment at the grand Banff Springs Hotel which we reached by a winding drive along a mountain road. At the Bow River Grill that overlooked the mountains and the Bow Valley below, we found ourselves overwhelmed by the choices available at the buffet table. Determined to try out the local game, we tasted elk burgers, medallions of Canadian buffalo, venison steaks in a Bordelaise sauce and roasted wild boar. Every single meat was so succulently cooked that it seemed to melt in our mouths and each one tasted completely different, the accompanying sauces simmered long and slowly to extract every last bit of flavor. Though we started with Coconut Coated Tiger Shrimp, freshly-harvested mussels gently steamed in white wine and served in a raspberry cream sauce and Buffalo chicken wings, we made sure that we savored each course slowly and left room for dessert. Indeed, the selection of sweets was quite astounding and as we relished the Tri-Chocolate Terrine, the Mango Mousse, the Mocha Cheesecake and something called Hello Dollies (a delicious combination of cookie crumbs, roasted nuts, chocolate chips and caramel sauce), we felt so stuffed we could barely stand, leave alone follow a guide for what was a guided tour of the “Castle” as the hotel is called. The Banff Springs Hotel is one of the great Rocky “mountain lodges” and Canadians are fiercely proud of these posh heritage buildings that sprouted after the hot sulphur springs were discovered in the Rockies at the end of the nineteenth century. Perched on the mountainside and completely enveloped by stately conifers, the hotel cuts an imposing figure with its stone siding and its gabled roofs in shades of verdigris. As hordes of people poured into the West Country to “take the waters”, urged on by the creation of the Canadian Pacific Railway that finally reached the west coast, Canadian entrepreneurs and hoteliers such as Van Horne, originally from the highlands of Scotland, saw a new way to tempt them into the wilds by creating super-luxurious accommodations that would provide every possible creature comfort. The thistle, Scotland’s national flower was the recurrent motif throughout the castle seen woven into the carpets, on mosaic tiled floors, on wrought-iron doors, etc. As we explored the massive environs of the hotel, gasped at the huge size of the rooms designed in Medieval, Tudor and Al-Hambra styles, their fittings and accoutrements, the Victorian conservatory with its pretty trellis overlooking the golf links, not to mention the stunning views from every curtained casement, we realized why the Rockies developed as rapidly as they did into the playground of the rich and famous. Today, many visitors arrive in Banff and Jasper on the Rocky Mountaineer, a deluxe train that provides its passengers with accommodations for a couple of nights in these fancy hotels and allows them to experience the grandeur of the mountains in the same comfortable way that their predecessors once did. That afternoon, replete with a meal that had proven to be incredible value for money, we took the Trans-Canada Highway to Lake Louise. And what a sight awaited us at the end of that one hour drive! As Llew picturesquely put it, “Lake Louise is one of God’s masterpieces!” Indeed even if one were an atheist, one would have to accept that only a Higher Being could create so stunning a scene (left). The lake, aquamarine and mirror-clear, sits at the base of Victoria Glacier that soars behind it. Framing the lake on two sides are twin mountains. The stark white of the glacier, the aqua-blue of the lake and the emerald green of the pine-draped mountains combine to create a sight so breathtaking that it is no wonder that it is has become iconic in Canada and is used on most posters advertising Canadian tourism. Named after one of Queens Victoria’s daughters, the lakefront is like a magnet drawing visitors to capture futilely its indescribable beauty on celluloid. After we posed for pictures together with busloads of other visitors, we started to walk along Lake Louise’s famed shoreline, but alas, it began to drizzle big fat drops that caused expanding rings in the water. We weren’t able to complete our ambitious plans to reach the Teahouse at the end of the hike, but we did nip into the lovely and very luxurious Chateau Lake Louise, a beige building on the edge of the lake, another wonderful “Mountain Lodge” that is as famous as the one in Banff. With evening swiftly descending upon us, we took the meandering mountainside detour towards Moraine Lake, a less visited but, in our opinion, no less startling lake. Indeed Moraine Lake is encircled by the peaks of the Ten Sisters, a chain of mountains that seem so close that you can be fooled into reaching out and touching them. The cobalt blue of the water at Lake Moraine has to be seen to be believed and though we spent a great amount of film trying to capture that dazzling shade, we simply don’t feel as if we were able to do justice to it at all. Choosing to see the lake from an interesting vantage point, we hiked up to an overview which also gave us an opportunity to see a pika, a small rodent-like creature with the cutest round ears and no tail! Our strenuous treks that day led us straight to a trendy Western-style club called Wild Bill’s Legendary Saloon where we chilled to country and western music from a live group called Chronic from Edmonton over cold Canadian Molson beer. Early the next morning, we breakfasted heartily and headed for the rental bike store on Bear Road. There, outfitted with suitably-sized bikes, helmets and trouser straps, we headed on the Cave and Basin Trail towards Sundance Canyon. To say that these two hours spent pedaling into the wilds was exhilarating is to say the least. As we biked out of town, we circled the Cave and Basin National Historic Site (which we would stop to visit later) following the banks of the incredibly blue Bow River, past the dog-toothed peak of Mount Norquay (which we would climb later than day) and luxuriant coniferous forests towards Sundance Canyon way in the distance. Most of the trail went downhill, providing us with some fantastic speedy runs that brought the wind rushing into our faces. Llew and I enjoyed every single second of this thrilling bike ride and chose to take the Marsh Loop on our way back to town, passing vast wetlands full of bird life and a number of kayaks and canoes with enthusiastic rowers on the river who waved to us as we pedaled. At the end of a two hour bike ride, just before we turned them in to the rental store, we visited the Cave and Basin National Historic Site, a most interesting place that is perched on the mountainside and conceals the original hot thermal sulphur springs that first brought visitors to the parks. Known only to the native Stoney Indians for centuries, the secret was shared with employees of the Canadian Pacific Railways who instantly thought of capitalizing on their find. By 1886, the Banff Hot Springs were perceived as therapeutic. The earliest visitors rowed along the Bow River, then climbed the strenuous reaches to get into the springs for repeated dips. Today, the springs, set at the base of a dark and circular rock cave, are only open as a museum exhibit. One can still see the waters steaming gently in the mountain air but no one is allowed to plunge in anymore. We had to save that experience for later in the day. But we also enjoyed the exhibit in the museum that quoted the words of early explorers in the Canadian Rockies who were enchanted by the landscape and waxed eloquent about it in their journals. A.P. Coleman, for instance, visiting in the 1880’s, wrote that being in such virgin country was “like catching Nature unawares in the act of Creation”. Indeed, with our bikes returned, we hurried off to meet Llew’s friends from Karachi, Birchman and Vicki Pereira who drove up from Red Deer near Edmonton to spend some time with us at Banff together with their grand-kids Madeline and Brandon. They drove us up Mount Norquay for a bird-eye’s view of Banff Township that slept quietly in the watery sunshine. Birchman and Vicki then suggested that we give ourselves up to the soothing delights of the Banff Upper Hot Springs, a large pool (left)that opened by the 1920s to accommodate the overflow of visitors that poured into the mountains for sulphur soaks. Driving up the mountain roads, we arrived at the lockers where we rented old-fashioned swimsuits (dating from the 1920’s) and joined a large number of visitors who enjoyed the steaming waters. This giant bath-tub reminded us very much of a similar soak we had taken last year at Budapest, Hungary, in the Scezeni Hot Springs, a Hungarian past-time that is enjoyed by young and old. This Canadian experience was made special by the fact that we were surrounded by lofty mountain peaks and the fresh scent of spruce trees. Then, having worked up an appetite for lunch, we settled down at East Express for large plates of Chinese foods that allowed us to catch up on our lives and reminisce about mutual friends. 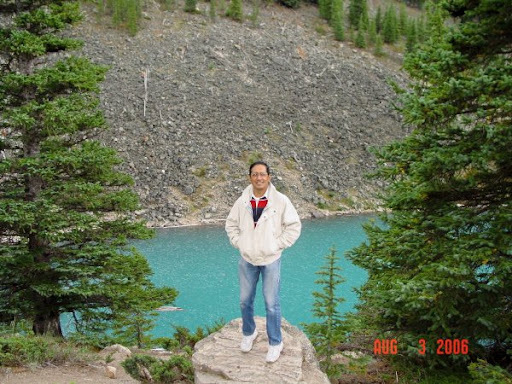 Later that afternoon, we drove to Lake Minnewanka, a large artificial lake, created from glacial run-off, that provides the region with drinking water. Boat rides are available on the lake, but, once again, developing rain sent us scrambling back to town. Mercifully, the weather cleared up by the time we reached the Strip, allowing us to arm ourselves with ice-cream sundaes and browse together in the shops such as The Bear and Butterfly where a great amount of native Canadian Indian pottery, ammonite jewelery, jade figurines carved from local Rocky Mountain stone, etc. were quite enticing indeed. When our friends left, Llew and I spent the evening on another driving tour, this time heading out of town towards the Tunnel Mountain Loop. It was a long weekend in Canada and the parks were filling up fast that Friday evening with a caravan of RV trailers that climbed the mountain to find parking in the many campgrounds that dot the area far from pedestrian traffic. We stopped along the Hoodoo Trail to see the peculiar limestone formations up close, viewed Tunnel Mountain that loomed large ahead of us, spied the Banff Springs Hotel in the distance beyond the reach of the minor tributaries that laced the landscape picturesquely. Then, we continued our drive to Surprise Corner on the other side of the mountain where the Banff Springs Hotel sprang hugely into focus on the opposite bank of the Bow River while the rapids churned deafeningly below. Soon, we were returning to town and settling down to a slap-up dinner at the well-touted Maple Leaf Grille and Spirits where we ordered bison tenderloin stroganoff and apple crusted roast pork loin. Exhausted by our tireless activity of the day, we gratefully returned to the comfort of our lodge. highways. North of Banff, the landscape gets progressively more awe-inspiring as even higher mountain chains come into view. Ice-encrusted for the most part, due to the slow accumulation of snow over centuries, these heights are breath-taking. The drive from Banff to Jasper would normally take about four hours; but if the visitor stops, as we did, at every natural wonder and scenic lookout point, it could take anywhere between 10 and 13 hours. We left Banff at 9.30 after breakfast and arrived in Jasper only at 6pm. Since we are great believers in the adage that one ought to enjoy the journey as much as the destination, we made every important stop, scaled every challenging precipice, descended into every extraordinary ravine, and, much to our profound joy, walked on glaciers. The first few stops along the Icefields Parkway took us to spell-binding lakes and canyons. Take Bow Lake, for instance, where the waters were so still that the lake created perfect mirror images of the mountains and glaciers that ringed it. We also saw Crowfoot Glacier that is fast receding due to global warming. One of the crow’s toes has disappeared completely though it did exist until the 1960’s. To reach Peyto Lake, we had to hike up a steep incline past the tree line and into Alpine Tundra where we encountered meadows just chockfull of wild flowers such as Indian Paintbrush, a spikey flower whose color changes from red to pink to orange at different times during the season (hence its colorful name!). Though the trek was challenging in the extreme, we were rewarded by the sight of the most marvelous jade green lake sitting quietly in the silent valley below. Luckily, we were blessed by an amazingly temperate day that despite the long climbs and intense waking did not leave us spent. It wasn’t long before we learned the reason for the incredible color of these mountain waters. Fed by glaciers, these rivers and lakes carry with them a massive amount of eroded material or glacial silt that stays suspended just below the surface of the water. Called “rock flour”, it is these tiny particles that glimmer in the sunlight and give the rivers and lakes their jewel-like green-blue colors. Llew, as always, drove expertly along the curving hairpin bends of the mountain road, but I often felt sorry for him as he seemed to miss the glorious landscape from which I just could not take away my eyes. A few miles later, we were at the Mistaya Canyon, a natural formation to which one descends down a steep mountain path. Needless to say, I did not relish the thought of climbing back up to the surface. However, once we were at the base, we were completely taken by the narrow but very deep canyon that the Mistaya River has cut into the limestone crags of rock. Surrounded by the gushing waters of the river, the rest of the world seemed to stand still for us as we listened to the constant roar of gallons of water tumbling over giant boulders. Since we paused to read the many signs that explained natural phenomena to us along these interpretative trails, the ascent to the top did not seem half as frightful as I had expected and it was with renewed energy that we set out in the invigorating air for the remainder of our journey to Jasper. Soon we arrived at the Icefields Center, an oddity of sorts in the midst of that unspoiled mountain scenery. A squat building that was built as recently as 2000, the Icefields Center is the starting point for any kind of excursion to the Athabasca Glacier that sits right opposite it. Giant snowmobiles transport visitors to the surface of the glacier allowing them to walk upon it at leisure for the princely sum of $35 per head. We preferred the challenge, however, of climbing on to the glacier (for free) and we set out right after we had eaten our picnic lunch of ham and cheese sandwiches. We drove our car as far as the parking lot, then began the slow ascent up the glacier. As we covered the extensive landmass, we saw signs telling us how far up the road the glacier had existed in the year 1880. Soon we were able to see where it had shrunk by 1900, where it had stood by 1920 and so forth, until we did finally reach the present freezing heights. This was a slow but steady climb and the temperature got progressively colder. Fortunately, we had known that we’d be walking on glaciers that day and we had taken precautions to dress really warmly. In about an hour, we were standing on the frozen icy floor of the Athabasca Glacier (above left), a truly formidable experience. It was hard to believe that this body of frozen ice has existed for centuries. Even as we watched, we saw rivulets of icy water making their way into the streams at the base—a sure indication that global warming is affecting the thickness and density of these glacial deposits. Llew and I could not but remember that a few years ago, we were walking on solid lava that had been left behind by active volcanoes in Volcanoes National Park in Hawaii. Now here we stood walking on ice and the striking contrast was not lost on us. After we had taken pictures, trying in vain to capture the majesty of the glaciers and the frozen ice-covered mountains that surrounded us, we slowly made our way back to the car, filled with such a sense of awe that both of us were speechless. Banff National Park is pockmarked with canyons and waterfalls, some not very impressive, others deeply stirring. The Sunwapta Falls and the Athabasca Falls, for instance, were really nothing to write home about but they made us aware of the many rivers that crisscross this territory—the Bow, the Miette, the Saskatchewan, the Mistaya, the Sunwapta and the Athabasca. Canada has carefully retained the original native Indian names of all these rivers and the park rangers try hard to instill in visitors the same respect for the environment that characterized the behavior of the earliest human settlers in this region, the Athabasca Indians. Another few miles later, we found ourselves skirting around Jasper National Park. Mount Edith Cavell came into view and in the distance, we could see Mount Robson, the highest peak in the Rockies. But just before we entered Jasper Township, we spied herds of elk, all sunning themselves in the late evening light, quite oblivious to the presence of delighted visitors who stopped frequently to take pictures. When we did arrive in Jasper after a very strenuous day spent climbing up and down canyons and dampened by the spray of thundering waterfalls, we found our accommodation very easily and settled down with Gord Antonius, the park ranger who offered us several wildlife guides to the Rockies and welcome information on where to go out in search of dinner. We settled for a Greek meal of dolmas (rice stuffed grape leaves, my favorite), donner kebab and spankopita (spinach and feta cheese in phyllo pastry, Llew’s favorite) at Something Else, a restaurant that afforded us lovely views of Patricia Street, the main artery that runs through the township. Exhausted from our adventures of that day, we ate heartily and slept as soundly as hibernating bears! Since our accommodation did not offer breakfast, we went out in search of it and at Gord’s recommendation, arrived at the Bear’s Paw, one of the world’s most-reputed bakeries, if you went by the long lines that reached well outside the doors! And we could see why. Inside was a mouth-watering array of breads and scones, bagels, muffins, sandwiches, Danish pastries and pies. It was next to impossible to make a choice from the enticing possibilities, but we stocked up on both breakfast and lunch items with the idea of picnicking at leisure for the rest of the day. With cups of steaming coffee and hot chocolate, we drove out to discover Jasper heading first for Patricia Lake and Pyramid Lake by whose placid shores we munched on muffins and sipped our warming drinks. Fuelled for the rest of our day, we walked across the short bridge that led to Pyramid Island, so-called because it sits in the massive shadow of Pyramid Mountain. Popular with wedding couples as the perfect spot for their pictures, this little island in the middle of the lake was a quiet haven. On the lake, we could hear the quiet swish-swish of paddles from the occasional canoe that was out on the water. Though it was hard to drag ourselves away from such tranquility, we were soon driving towards the famous Maligne (Maleen) Canyon where we had to undertake another long and challenging descent downhill. Steeply carved in the mountain face, this trail required the hiker to cross six bridges that connected one side of the canyon with the other at different intervals. All the time, one enjoyed the damp but cool environment created by rushing water and the virtual lack of sunshine, thanks to tall vegetation. In fact, moss grew everywhere and made a soothing green carpet as we negotiated our way up and down those craggy rocks. When we got to the base, I was so tired that I promptly curled up on the rocks by the waterside and took a short nap. Lulled by the rushing waters, the sharp rock face staring at me just ahead, the towering branches of aspen trees and the occasional cheep cheep of birds, I enjoyed one of the nicest naps I have ever taken as Llew went off in search of the sixth suspension bridge even further down in the valley. I have taken naps during my travels in rather unlikely places and I know that this is one I will not forget. Soon we were in our car again bending and curving around the many U-turns of the mountain roads on our way to Maligne Lake. But before we reached there, we passed by the almost dry beds of Medicine Lake, so-called by the Indians because it “disappeared” during some parts of the year and the Indians believed that this had to do with spells cast by their medicine men! It was here that we encountered a whole herd of long-horned mountain sheep right in the middle of the road. All traffic slowed down to allow the lazy animals to pass by, though several cars stopped to take pictures. Joining the curious hordes, Llew was rewarded for his interest by a ram who came right up to him to smell his palm, nuzzling it affectionately, much to Llew’s astonishment and delight (left)! 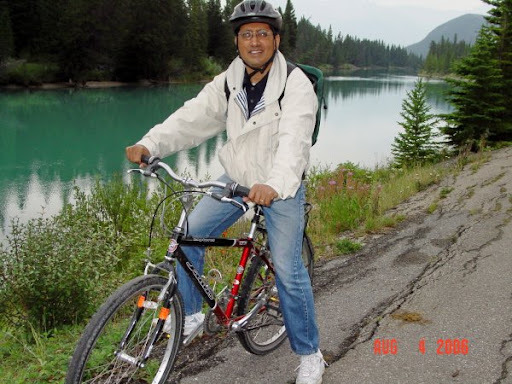 When we had quite recovered from the joy of seeing so much wildlife seemingly so tame, we continued on our drive to Maligne Lake, a large expanse of water on which all kinds of water-sports are practiced such as kayaking, canoeing, water-skiing, etc. It was on the banks of this lake that we ate our picnic sandwiches and then decided to take short naps, as much to enjoy the calm serenity of the landscape as to rest from our exhausting treks of the morning. Little did we know that we had one more challenging hike ahead of us yet! Yes, within a short while, we were re-tracing our steps and driving back to Jasper Township in search of the Jasper Tramway, a cable car that whisks visitors up to the mountain tops to experience the eerie stillness of altitudes that only mountain-climbers can dream of conquering. For the sum of $23 each, we bought tramway tickets and patiently waited our turn to board our “flight”. When we did start to rise high above sea level, the outline of the town of Jasper—a very clear J-shape–became evident. Even higher, we passed the tree line and began to ascend into tundra altitudes where the only vegetation capable of growing in the dry and icy air is lichen and moss. At this point, we had dramatic overviews of the mountainscape below, the occasional lakes that punctuate the landmass, and the Athabasca River that flows through the township. When we alighted from the tram car, we could have stayed right there and elected to return to the base whenever we pleased. But, of course, we were not content with doing that and next thing you knew, we were scaling the steep sides of Whistler Mountain to try to get up to the very summit, several hundred feet above us. This was a long, steep and very challenging climb indeed and we did it slowly. Though we’re both in great shape, thanks to all the workouts we do all year round, I found myself huffing and puffing with the effort and had to rest frequently on our journey to the summit. By this point, the crowds had thinned out as only a few people felt strong enough to encounter such heights. Not to be daunted, we continued along the way, struck by the sheer silence of those peaks. We had 360 degree views of the mountains, snow-sprinkled and dazzling in the dying rays of the sun. Twilight brought an almost magical quality to the mountains and combined with the silence, I felt as if I were in an other-worldly place. Heaven must feel like this, I thought to myself, as my eyes roamed over the most pristine landscape as rocks, mountains, rivers, and lakes combined to create an effect that was so phenomenal, it brought quiet tears to my eyes. When Llew left me to climb even higher, I sat back on a giant rock and listened to the awesome sound of silence and, believe me, I felt transported somewhere beyond our earth–almost to another planet. This, for me at least (left) , was one of the most unexpectedly moving of experiences on this trip and I know that I will never be able to forget my feelings as I stood on the summit of Whistler Mountain with nothing but the companionship of friendly mountains enveloping me. All to soon, with the light quickly fading, we made our way back to base camp, took the tramcar and arrived at Jasper in search of dinner as both of us were starving by that point. Though we had many choices, we elected to eat at L&W Family Restaurant, because the way it was written, it looked like LEW Family Restaurant. We could not have made a better choice. The Alberta Prime Rib that we ordered was so astonishingly good, it reminded us of the scenes in Brokeback Mountain where the main characters are cowboys keeping watch on herds of Alberta cattle! I understood that story then…I understood why the stark loneliness of the landscape would convert even the straightest of people into homosexuals—so great, I figured, would be the need for compatible companionship, if one were in the great outdoors for weeks on end with no other human being in sight. Indeed, the landscape can be more than a little frightening in its stark silence. There is a terrible beauty about the place which begs for a loved one to share it with and I was glad to have Llew with me, appreciating every crag, every corner, every curve. The next day marked our return to reality. I had come close to having a supernatural experience on the mountain-tops. So, it was with a heavy heart that I packed my bag the next day to undertake our drive back to Banff and from there on to Calgary where we needed to return our rental car. Perhaps it was the spirituality of our environs which made me react as uncharacteristically as I did, but when we spotted a hitch-hiker standing on the side of the road with a sign that said “Banff”, I urged Llew to stop and pick him up. Now we had never ever done anything of the kind on all our travels as we know better than to subject ourselves to the company of some smelly stranger or, worse yet, someone with a gun bent on robbing us. But Llew was persuaded and turn around we did to pick up Toby, who turned out to be a 29-year old German trainee fire-fighter who had arrived in the Rockies to do some serious mountain-climbing. Well, he was so grateful for the ride and for our Bear’s Paw goodies that we shared with him for breakfast. Well-educated and well-traveled around the globe, Toby regaled us with fascinating stories of his travels as our car ate up the miles. At times, I dozed off, lulled by the constant beauty of the passing landscape and the soft purring of the engine. 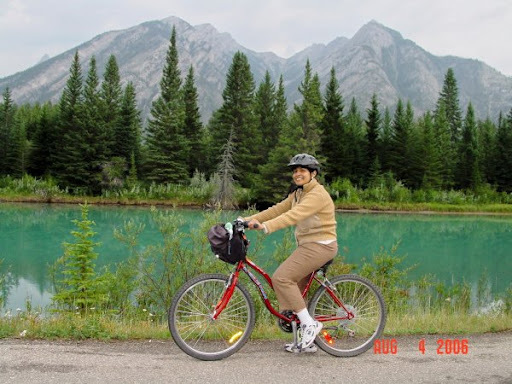 Before we knew it, we were in Canmore, dropping Toby off at his request, then setting off on the last lap of our journey towards Calgary where we attempted to find our River Wynde Executive Bed and Breakfast where we had made arrangements to spend the night. Our hostess Diane checked us in, showed us into our “Earth Room”, where we stashed out stuff and went out in search of the city. The next lap of our travels in Alberta showed us the city of Calgary. Please click on the link to join our exploration.